Food for the Grade 8 Graduation Ceremony? The Grade 8 Graduation Celebration is on Tuesday 27th of June. It is the tradition at Bowmore to ask Grade 7 parents to help with this event so that the parents of Grade 8 students can focus their attention on their children on that day. We are hoping that Grade 7 parents and students will be able to donate a food item for the afternoon event. Many families didn’t have a chance to return the form to their child’s classroom teacher on Friday. 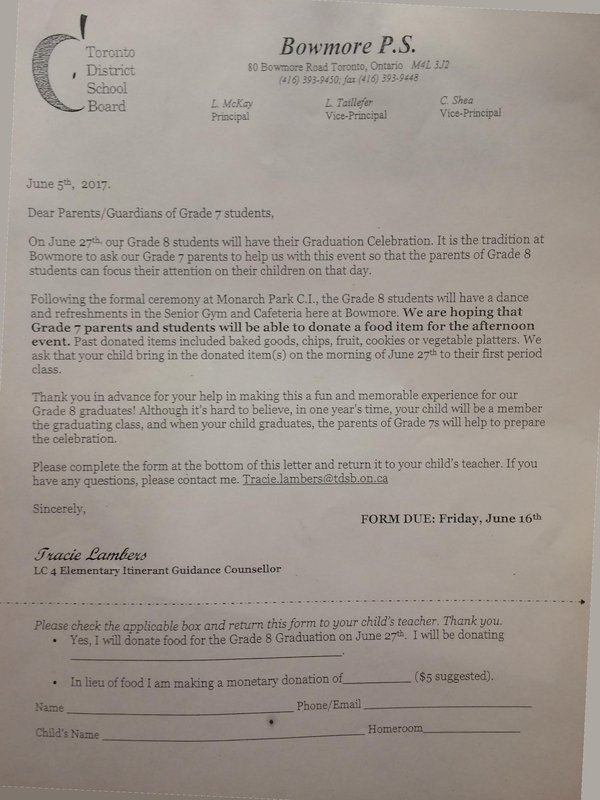 We are asking that Grade 7 families who are planning to contribute please fill in the food donation form so that the organizing team can plan the celebration. The form can be handed to your child’s classroom teacher. Thank you in advance for helping us with this year’s graduation. Although it’s hard to believe, in one year’s time, your child will be a member of the graduating class, and when your child graduates the parents of Grade 7s will help to prepare the celebration.